There is very little historic information on King Cnut even though he was the most powerful king in northern Europe in the early eleventh century. He was King of Denmark and England, for a time King of Norway and possibly lord of part of Sweden. England had suffered from the weak and ineffectual reign of King Aethelred the Unready for nearly thirty-eight years. The kingdom of England was in ruins and the people were ready for peace. After the death of King Aethelred’s son Edmund Ironside, the English people endorsed the Dane Cnut as their king. Cnut began his rule with fear. He didn’t hesitate to kill those who tried to question his authority. Eventually he loosened his grip. He legitimized his authority by removing native rivals, marrying his predecessor’s queen, maintaining the continuity of government and acting in every way as a just and equitable king. In this way he garnered the support of the Danes and the English and could arguably be called the first king of the English. The Viking attacks during the reign of King Aethelred started in the 980’s. In November of 1002, Aethelred ordered the massacre of all the Danes in the area of northern England known as the Danelaw. Unfortunately, the sister of King Sweyn of Denmark was killed during the slaughter. In a possible personal vendetta, Sweyn began a long lasting campaign against Aethelred and the English. Sweyn had a son named Cnut, whose birthdate is estimated to sometime between 988 and 995. Cnut’s mother was most likely an unnamed sister of the Polish king Boleslaw I. The records tell us nothing about Cnut’s childhood but the sagas say he was tall, strong and handsome. When Cnut was old enough, he may have joined his father on campaign in England. We know he came to England in 1013 and was left in control of the Danish fleet in the north. It was during this time he took a wife in a possible bid to strengthen his position. She was named Aelfgifu, the daughter of Aelfhelm who had been ealdorman of Northumbria until his murder in 1006. This union was never recognized by the church and by 1017 the couple had two sons, Sweyn and Harold (Harefoot). King Sweyn managed to overrun most of England and by late 1013, the English had submitted to him and he was named King of England. Aethelred, his second wife Emma of Normandy and their sons were forced into exile in Normandy. Sweyn’s reign had only lasted a few months when he died on February 3, 1014. The army proclaimed Cnut king but the English people invited Aethelred back if he promised to rule better than he had before. Aethelred acted uncharacteristically with speed and strength and drove Cnut and his forces out to sea. Cnut decided not to press the point at this stage and returned to Denmark. On the way back he dropped off some hostages he had in his possession minus their ears, noses and hands. Cnut decided to invade England in September of 1015. 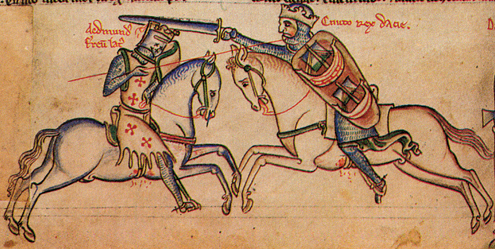 Aethelred was sick and his son Edmund was raising and leading the English army to fight the attacks. By Christmas, the people of Wessex recognized Cnut as king and paid tribute. On April 23, 1016, King Aethelred died and the men of the king’s council, along with the citizens of London elected Edmund king. But there were other councilors, bishops, abbots and ealdormen that elected Cnut as king at Southampton. It was time for a showdown between the two men. Cnut began an unsuccessful siege of London and at the same time had marauding armies which engaged Edmund in several battles. The final engagement occurred on October 18, 1016 at Assandun and Edmund was defeated. Many of the English nobility died in the battle but Edmund would live to raise another army. Cnut decided to negotiate a temporary truce and the two men met at Alney. Edmund would retain the kingdom of Wessex and Cnut had the rest of England. By November 30, Edmund was dead. He was either poisoned or stabbed on the orders of Cnut or Eadric Streona of Mercia or he may have been injured at Assandun and died of his wounds. The consequence of his death was that Cnut was now master of the whole of England. Cnut was young and inexperienced at government. He divided England into four parts and gave control of these kingdoms to important men. East Anglia went to the Danish Thorkell the Tall. Eadric Streona kept Mercia. 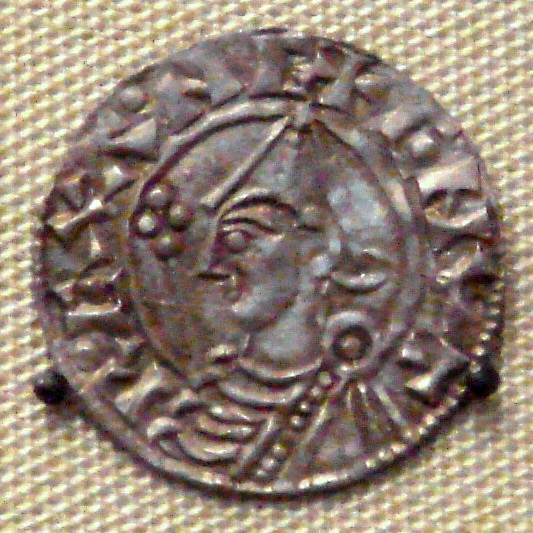 Northumbria was held by Eric of Norway and Cnut kept Wessex for himself. Initially Cnut’s rule in England was harsh. Before the end of 1017, Cnut had Eadric Streona murdered along with four other ealdormen. But he didn’t wipe out the Saxon nobility because he recognized he needed them to maintain the established apparatus of government that existed in England. In order to keep Aethelred’s sons Edward and Alfred from challenging his authority, he married their mother Queen Emma in July of 1017. Marrying Emma kept continuity with the prior dynasty and he came to rely on her experience and political acumen. The fact that he was already married may have caused embarrassment but he didn’t dismiss his first wife. Perhaps Aelfgifu was his mistress or his “hand-fast” wife in the Scandinavian tradition. It was assumed that the children by Aelfgifu were heirs to the thrones of Denmark and Norway while Emma’s children by Cnut would be the heirs to the throne of England. Emma had two surviving children with Cnut, a son Harthacnut and a daughter Gunhilda. In 1018, Cnut fought off about thirty Viking crews who had entered English waters. Cnut wasn’t going to keep a large and dangerous army and fleet in England and needed cash to pay them off. Because the English government had the mechanism in place to collect taxes, he was able to raise 82,500 pounds and pay off the army so they could return to Denmark. He reduced the naval fleet to forty ships. He then called a council of Englishmen and Danes at Oxford. Relations were normalized between the Danelaw and the rest of England. All agreed to live in peace and Cnut agreed to rule according to the traditions and laws in place at the time of King Edgar the Peaceable, Aethelred’s father. Cnut’s brother, King Harold of Denmark died in 1018 so Cnut traveled there to claim the throne for himself and settle affairs there. There was little trouble in England while he was gone. He stayed in Denmark over the winter of 1019-1020. While there he composed and sent a letter to the English people promising to keep them safe from invaders and to carry out and enforce the laws of the land. In 1020, Cnut called a council at Cirencester. He banished Aethelweard, ealdorman of the western provinces. We don’t know why but he may have been conspiring against Cnut. There was trouble between Cnut and Thorkell the Tall in 1021. Cnut proclaimed Thorkell an outlaw and banished him to exile in Denmark. In 1022-3, Cnut made another trip to Denmark where he reconciled with Thorkell and made him regent and foster-father to his son Harthacnut. In 1023, the Anglo-Saxon Chronicle records the festivities of a week-long ceremony where the remains of the sainted Anglo-Saxon Archbishop Aelfheah of Canterbury were translated from London to Canterbury and reburied. Aelfheah had been murdered by the Danes eleven years before. Cnut had now atoned for the atrocities from the past and was reconciled with the English people. The Anglo-Saxon Chronicle then goes very quiet regarding the reign of Cnut. What little bits we have mention events from far away. Cnut invaded Sweden in 1026 and fought in the battle of Holy River. It’s unclear if he won or lost the battle but it seems he did rule part of Sweden for a time. In 1028, he conquered Norway and in 1030 he placed his son Sweyn and his wife Aelfgifu as king and regent there. But Aelfgifu was bad at governing and by the time Cnut died in 1035, she and her son had been driven out of Norway by King Magnus. In 1027, Cnut made a trip to Rome to attend the coronation of the Emperor Conrad II. Conrad’s son Heinrich would marry Cnut’s daughter Gunhilda in 1036. While Cnut was in Rome, he was accepted and treated as an equal with the other rulers. His trip was a resounding success. He would travel to Rome again in 1031. Cnut realized he needed to establish good will with the church in England and did what he had to do to get along with Archbishop Wulfstan of York and Archbishop Lyfing of Canterbury. He became more pious and gave lavish gifts to the church to garner favor. Wulfstan and Cnut worked on the already established law codes of the Saxon kings, augmenting and improving them. Around 1031, Cnut attempted to impose his authority over Scotland and Wales. He apparently wasn’t too successful in Wales but he did visit Scotland. It is unclear if he took an army or if it was a diplomatic mission. He came to an agreement with King Malcolm II of Scotland and two other sub-kings and gained control of Bernicia. Toward the end of his reign, Cnut began to rely more on English as well as Danish noblemen. 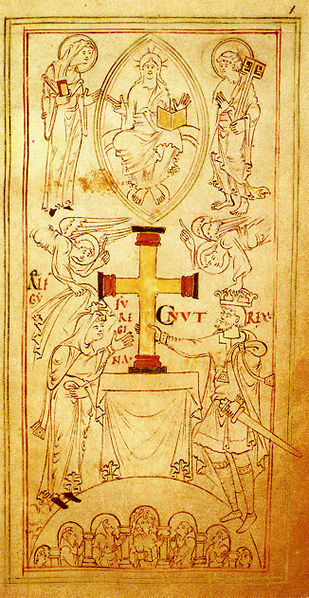 He had made Godwin earl of Wessex and Leofric was in control of Mercia. He reduced the number of ships in his fleet from forty to sixteen. He had significantly raised taxes to pay for his army and fleet and bodyguard of housecarls. The English people suffered from the heavy tax burden but in return enjoyed peace and economic prosperity. He had earned the support of the people by ruling according to Anglo-Saxon tradition and enforcing the laws. He was respected and admired. After a reign of nineteen years, Cnut died at Shaftesbury on November 12, 1035. He was buried in Winchester Cathedral. His policy of dividing the kingdom may have weakened the monarchy, giving the earls great power during his absences from England. He most likely intended for his son Harthacnut to succeed him. At the time of Cnut’s death, Harthacnut was in Denmark entangled in a struggle with Magnus of Norway and couldn’t leave without possibly losing his kingdom. Queen Emma and Earl Godwin wanted Harthacnut to become king of England while Aelfgifu and Earl Leofric were advocating for Harold Harefoot. The two sons of Aethelred, Edward and Alfred also had a claim to the throne. Because Harthacnut was delayed and Edward and Alfred were in exile in Normandy, the English elected Harold Harefoot king but the stage was set for another struggle for the English throne. I really enjoyed reading this, I love history and although I’d heard of cnut I was unaware of all of his story. Great post, Susan! It’s hard to grasp just how dangerous, brutal and short life must have been during that time. I am just reading Michael Wood’s book on the Dark Ages so this is especially interesting.